You sure get a lot of hardware in this machine. You buy a big and heavy 15.6-inch laptop so you can get real work done faster—that means a burly quad-core CPU and discrete graphics. Samsung’s Notebook 9 Pro packs those in, then adds an excellent 4K Ultra HD touchscreen and a 10Gbps USB 3.1 Type C port to the mix. 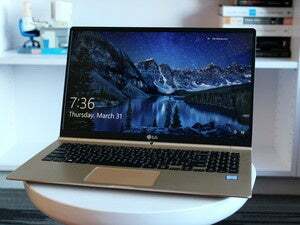 At $1,500 MSRP (available at Best Buy), it’s priced the same as competing laptops that have fewer high-tech features. That’s a hell of a deal. The Notebook 9 Pro has the classic look of a Samsung laptop, with a black, anodized-aluminum chassis and brushed-aluminum accents. At 4.5 pounds, this 15.6-inch notebook feels solid but is a little slippery, too—you’ll need to keep a good grip on it. Our review unit also had an overly stiff hinge that I had to crank on in order to reach its maximum 140-degree viewing angle, which made opening it while walking extra dangerous. While the Notebook 9 Pro is big at 14.75 x 9.75 inches, it's also surprisingly thin. The spots I measured on the body ranged from 17mm to 18mm thick, similar to the girth of Apple’s 2014-vintage MacBook Pro 15. Dell’s XPS 15 isn’t as wide nor as deep, but it's thicker at 19mm to 20mm. Dell’s new XPS 15 in the lower left corner with Samsung’s Notebook 9 Pro to the right. In the upper right is HP’s new Spectre X360 15T and a Dell XPS 13 on the upper left. More impressive is this laptop’s eye-catching screen. Samsung didn’t provide detailed specs, but it’s sourced from the company itself. You get a 15.6-inch 4K Ultra HD (3840x2160) panel with full 10-point touch. A very light anti-glare coating cuts down on reflections. The screen is rated at 350 nits, but I measured it a little over that at about 380 nits dead-center on our unit. Backlighting is very even, more so than on contemporaries like the Dell XPS 15 and the HP Spectre x360 15T. The backlighting does use PWM, which strobes the backlight when you reduce the brightness, for those who are sensitive to screen flicker at low brightness levels. Samsung also includes some image-tweaking utilities such as an HDR (high-dynamic range) mode. HDR is probably overstating the effect, but it does a help with shadow detail without blowing out highlights in images. It does have to be said that while high-resolution images look much sharper thanks to the use of a 4K UHD resolution panel instead of a cost-conscious 1920x1080 screen, you do really need get up close to the screen to see it. Nevertheless, this display’s size and resolution make it ideal for working on spreadsheets and in other situations where you need to see a lot of elements on the screen. The Notebook 9 Pro comes equipped with a full-size HDMI port, combo headset jack, three USB 3.0 Type A ports, a Kensington lock port, and a USB 3.1 Type C port. From what I can tell, that USB-C port is full 10Gbps USB 3.1, but its implementation is odd. On most laptops with USB Type C, you get USB 3.1 at either the full 10Gbps speed or the slower 5Gbps (what is sometimes still called USB 3.0)—or you get a Thunderbolt 3.0 port that also supports 10Gbps USB 3.1. In this laptop, Samsung uses Intel’s Thunderbolt 3 controller but enables only the USB support. The Samsung Notebook 9 Pro (bottom) gives you a full-size HDMI 1.4, 5Gbps USB Type A, analog combo jack and plain weird USB-C port. 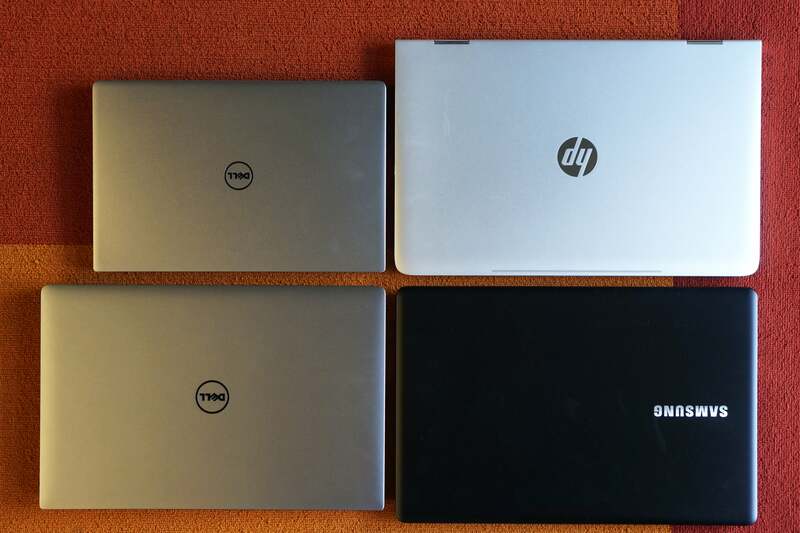 On top is a Dell XPS 15 with an HP Spectre x360 15T in the middle. Why the company would do that, I’m not sure. If Samsung went to the trouble to integrate a pricier Intel Alpine Ridge Thunderbolt 3 controller, why not give us the full monty? You do at least get 10Gbps USB 3.1 transfer speeds in the end, though. Using a Sandisk Extreme 900 USB drive, I measured transfer rates in the 600MBps range for read and writes through the port. That was a bit lower than the 700MBps I’ve seen on other laptops with full Thunderbolt 3 implementations, but it’s definitely better than being stuck at 400MBps on USB 3.0-only laptops. Inside the Notebook 9 Pro are a quad-core Intel Core i7-6700HQ, a GeForce GTX 950m graphics with 2GB of GDDR5, a Lite-On M.2 SATA SSD, and 8GB of DDR3/1866 RAM in two SO-DIMM slots. That last choice is a head-scratcher, because most of the competition has moved on to DDR4 for big Skylake laptops. But while being one generation behind in memory technology looks bad on paper, when you’re actually comparing DDR4/2133 vs. DDR3/1866, there’s little tangible difference during use. More concerning for performance fanatics is the choice of an M.2 SATA drive. Typical M.2 drives using a PCIe interface will hit 1.5GBps read speeds vs. the 548MBps I saw out of the Notebook 9 Pro’s Lite-On SSD. Write speeds were pretty equal, though (at least according to Crystal Disk Mark 5.1.2), with a rate in the 300MBps range. Most people assume the same part in Laptop A gives you the same performance as Laptop B. The truth is, manufacturers tune performance based on many factors, including how much heat a particular system will tolerate and the maximum temperature the laptop is allowed to reach. This is ultimately the stickiest part for the Notebook 9 Pro. Yes, it’ll easily crush the hollow skulls of any dual-core notebook, but being a big quad-core machine means it really competes with other quad-core laptops. As you’ll see, it can’t quite trade equal blows with them. 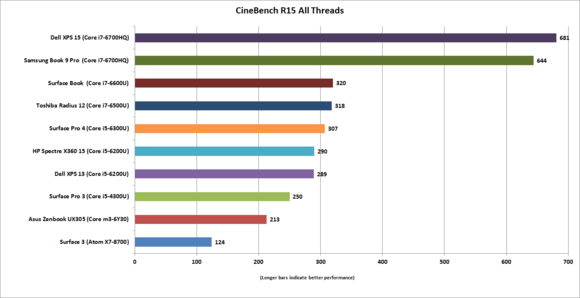 First up is Maxon’s CineBench R15. 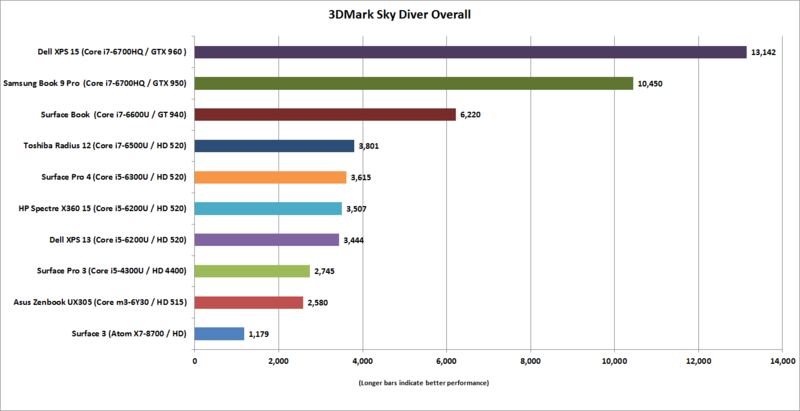 This 3D rendering benchmark is a CPU test that thrives on CPU cores. The Notebook 9 Pro easily waves good-bye to the dual-cores, including Microsoft’s vaunted Surface Book. 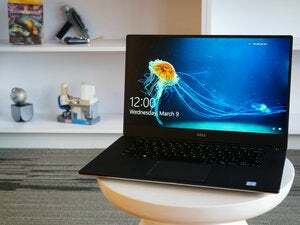 The problem is the difference between the Samsung Notebook 9 Pro (previously known as the Book 9 Pro and still identified as that in our chart) and the Dell XPS 15. Both use the same Intel Core i7, but performance is slower on the Samsung due to its lower clock speeds. 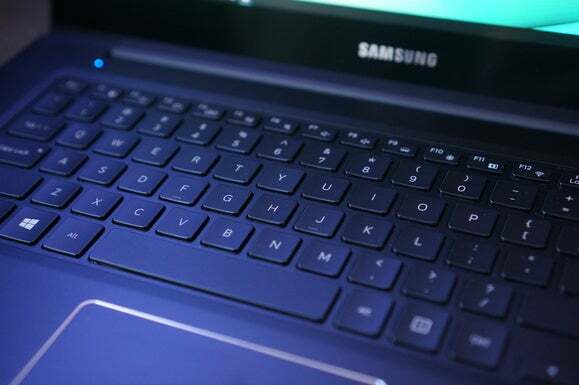 Despite having the same CPU as the Dell XPS 15, the Samsung Notebook 9 Pro was slower thanks to a lower top clock speed. The good news for the Notebook 9 Pro is that a slightly slower clock speed doesn’t add up to a lot on long workloads. 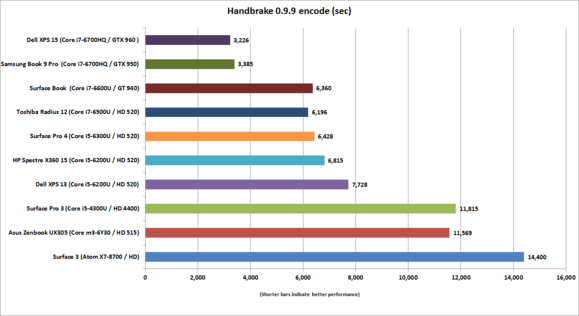 Our Handbrake 0.9.9 test transcodes a 1920x1080 30GB MKV into a lower-resolution MP4 using the Android tablet profile. 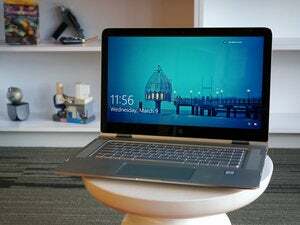 On a dual-core laptop, this test takes a couple of hours, but the quad-cores make quick work of it—including the Notebook 9 Pro with its lower overall clock speed. The Dell XPS 15 is still faster, though. Good news: this pure CPU encoding test puts the Samsung Notebook 9 Pro closer to Dell’s XPS 15 than it did in other tests. The real problem is the graphics performance. The Notebook 9 Pro has an Nvidia GeForce GTX 950M discrete graphics chip in it. 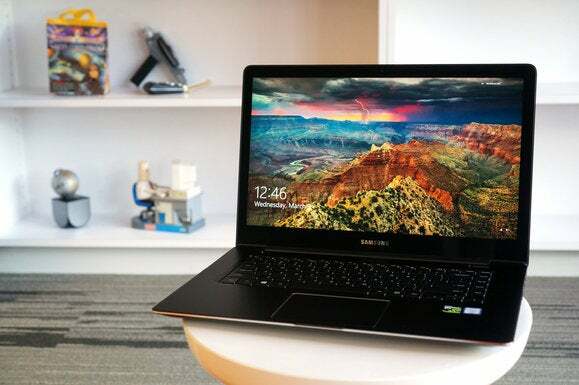 On paper, it’s not much different than the GeForce GTX 960M that Dell uses in its XPS 15. Both have the same memory bandwidth and amount of CUDA cores. The GTX 960M’s clock speed is also about 20 percent faster. The performance gap, however, is closer to 25 percent. It looks like Samsung decided to keep the fan noise on the Notebook 9 Pro as unobtrusive as possible. Under a graphics load, the XPS 15’s fans get loud. 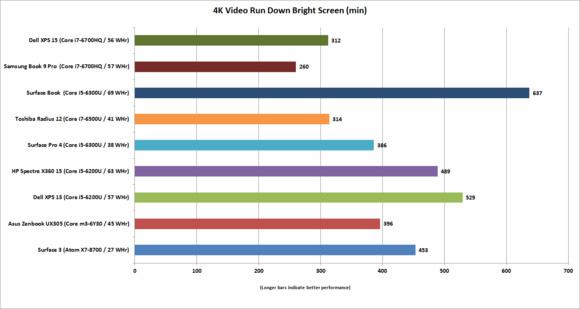 The Notebook 9 Pro’s don’t, but just know that the consequence is occasional slow-downs on a GPU that’s already slower than the Dell from the get-go. The Samsung Notebook 9 Pro’s graphics performance fell further off the pace of Dell’s XPS 15 than expected. This isn’t due to the type of memory used. The GeForce GTX 950M comes with an option to use much slower DDR3 or the far faster GDDR5 RAM, and Samsung smartly choose the latter. So why the larger performance fall than expected? I decided to push both laptops with a heavy graphics load and I found the Notebook 9 Pro significantly backed off in performance after a few minutes of use. I did this by running the Furmark torture test while monitoring the GPU’s clock speeds. When warm, it would drop off from 800MHz to 405MHz. Eventually, the Notebook 9 Pro would work the clock speeds back up to 700MHz, but that kind of dropoff is a little troubling. The Dell XPS 15, for comparison, would pretty much sit at its rated base speed of 1096MHz for an hour without varying much at all. The Samsung Notebook 9 Pro takes a pretty hefty performance hit when pushed hard. When you add up the energy costs of a 4K Ultra HD touchscreen and quad-core chip with discrete graphics, you’re not going to get a laptop that will play movies for the entire flight from Dubai to Panama. No surprise: The Notebook 9 Pro has a short battery life, with about 260 minutes of video playback. That’s probably the lowest we’ve seen out of a laptop, but we didn’t expect a long run with this much hardware. 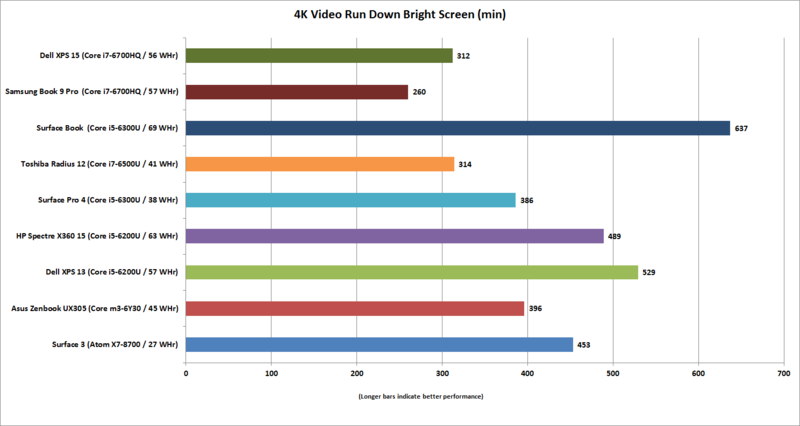 You’re only going to get about four hours of 4K video playback—not great, but with a large 4K Ultra HD screen and touch support, you shouldn’t expect miracles. I do think Samsung should have considered a bigger battery, though. Dell offers a much larger 84-watt-hour battery upgrade in some XPS 15 builds, and Apple’s MacBook Pro 15 uses a gigantic 99-watt-hour battery. The Notebook 9 Pro’s battery is simply too small for this much hardware, and it shows. The keyboard is spacious, with no obvious sizing or layout issues. I will say under speed typing, it feels harsh when the keys hit bottom, but keyboards are a subjective affair. It’s more important that the keys aren’t laid out in any deal-breaking, annoying way, and Samsung doesn’t make any mistakes here. The Notebook 9 Pro’s keyboard is comfortably full-sized with no odd keys. The trackpad is a standard piano-hinge design that gets harder to push near the top. I’d prefer it to feel smoother under my fingertips, like on the Surface Book, but it's a good device otherwise. Like the screen quality and backlighting evenness, the Notebook 9 Pro also gets a nod for having the best speakers. The audio output on the XPS 15 and the MacBook Pro 15 are decent, but the Notebook 9 Pro puts out a little more volume and has a fuller mid-range and low end than the others. As mentioned earlier, the one area where Samsung prevails is price. A base Dell XPS 15 with 8GB of RAM and a 256GB SSD will set you back $1,500. For the same amount, the Notebook 9 Pro gives you a 4K panel and touch capabilities. To get the same kind of screen on the Dell, you’ll have to fork over almost $2,000. That Dell does give you 16GB of DDR4 RAM, a PCIe SSD, a bigger battery, and a faster GPU. You’re still out another $500, though. Overall, the Samsung Notebook 9 Pro’s design seems like a compromise—perhaps a little too much so. It basically does everything well, but doesn’t truly excel at any one thing. The end result is that this laptop fails to stand out as the 15-incher to have, despite its bells and whistles. 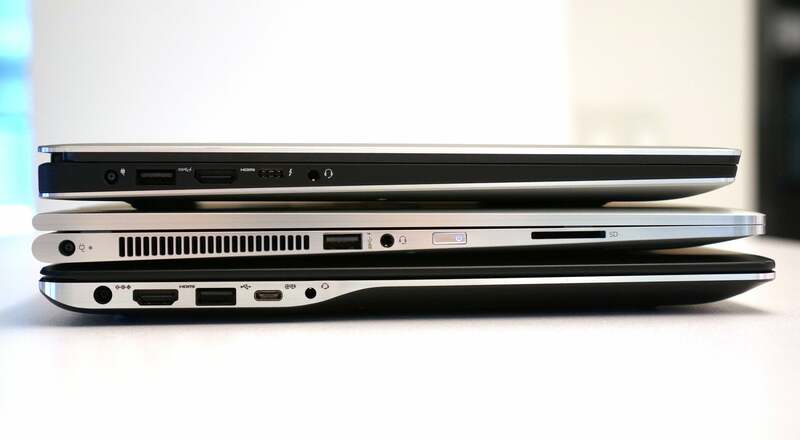 You can't get everything for nothing, so it's not a surprise that the Notebook 9 Pro has some oddities that keep it from being the 15-inch laptop to have. That said, comparable laptops like the Dell XPS 15 cost almost a third more to get the same specs and features. While you'll compromise some, you're getting a lot of hardware in the end.